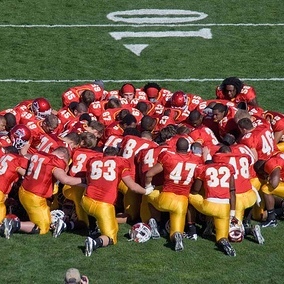 How many times have you seen football players – on the screen or just off the field—huddling for prayer before a game? You know what they’re asking for, right? They’re asking God to tweak the rules of biology and physics on their behalf: To make those fast twitch muscle twitch a little faster. To jack up a few hormones at the neurological synapses that govern visual acuity and reaction time. To shift the wind resistance on one side of the ball or alter the relationship between spin and trajectory. In other words, what they’re trying to do is to get a twelfth man out there on the field on their side—an invisible guy with superpowers who can play any position, like Mr. Incredible only better because he can go inside the other players and no-one can even see him doing his magic. Is that cheating? My friend, Mary, a devoted soccer player with an interest in ethics and law would say no. Praying before games isn’t against the rules, and Mary says you play to the rules. Within the rules, it’s a team’s job to seek every advantage. During the World Cup quarter final between Ghana and Uruguay, Luis Suarez deliberately stuck his hand up to block a goal, which cost Ghana a place in the semi-final and bought Suarez a red card. Even then Mary said Suarez wasn’t cheating—that’s how the game is played. He made his choice and took his penalty, and that was his job. Seek every advantage—including extra invisible players. NFL football doesn’t have a prohibition against or a penalty for pre-game prayers – even though they do penalize certain other attempts to enhance neurotransmitters and fast twitch muscles. Why? How come trying to recruit a magical number twelve right before the game isn’t against the rules? The obvious answer is that nobody save, perhaps, a few defensive linesmen and a winning quarterback with Bible verses on his eyeblacks actually thinks that supernatural players joins the game in response to pre-game supplications. If people thought they did, there would be rules. After all, whose sense of fair play and sportsmanship would be satisfied by a game that pits eleven humans against eleven humans plus, say, Superman? Also, the bookies would be paying pretty close attention to which teams prayed to whom. So why don’t refs, rule-makers, and fair-minded fans act like praying before games actually works rather than treating it like a lucky rabbit foot? My favorite answer is that everyone knows God isn’t interested in football. He’s a nerd. We’re talking about the guy who coded the DNA for tree frogs and wildebeasts and echidnas. How many geneticists and programmers do you see playing pro ball? God is the kind of guy who is more likely to be found hanging out at Burning Man than the Super Bowl. How come trying to recruit a magical number twelve right before the game isn’t against the rules? But my husband thinks something different is going on. He thinks people do believe in the power of football prayers – only not the same way that they believe in the power of a Mac truck coming right at them. It’s a fuzzy, iffish sort of thing, and if one team or the other can get it going, more power to them. May the righteous team win. I’m not so sure. Post-prayer football isn’t anything like that Old Testament contest in 1 Kings when the 450 prophets of Baal kill a bullock, put it on an altar for burnt offerings and then call down fire from heaven and nothing happens, and then Elijah, the prophet of Yahweh kills a bullock and then douses the offerings with water and then calls down fire to burn up the wet offerings and it’s so impressive that the people then kill the other 450 contestants. Now that is a story with a god who is definitely on one team. Maybe the people who pray football prayers, and those who watch them, and the rule-makers, have been conditioned by all of that woefully sad research about cancer prayers and heart attack prayers and such, where the most rigorous studies show no effect, and the ones that are less well controlled seem to show the hand of God operating at the margins of statistical significance. Maybe football is like healing. And maybe the risk of supernatural dabbling to the tune of a couple percentage points just isn’t worth regulating. But is pregame supplication cheating? Can we say that if there’s nothing in the rule book it’s fair game—or is that the letter of the law winning out over the spirit? And what if a player thinks football prayers works even if they doesn’t, and so he tries to get his god or guardian angel or whatever spirit he channels to tweak the odds in his favor. Is that cheating? What are the ethics of taking pills you think are steroids but are only placebos? I live near a Jesuit university with a deep, strong tradition of ethical inquiry. I wonder if their football team prays before games. ExChristian.Net: Is Praying Before Football Games Cheating?